Why doesn’t piperade get more playtime among the food cognoscenti? Surely, it’s not the shiniest new toy on the block – Gerald Hirigoyen, who was named one of Food & Wine’s Best New Chefs in 1994, opened this “California Basque” restaurant at the foot of Telegraph Hill with his wife in 2002. But eight years hardly makes it outdated, even if a good portion of the menu doesn’t change. 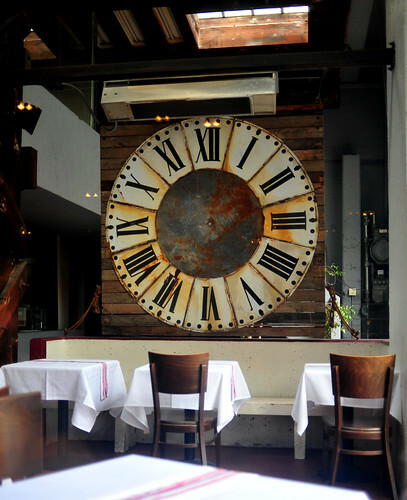 Suspended between the rustic traditions of the Old World and the forward-looking freshness of the New World west, the food at piperade, as suggested by the handless clock that dominates the restaurant’s patio, is timeless. Forget the trendy and new for a moment, Hirigoyen’s food is fantastic. I missed piperade on my trip to San Francisco in 2009, and I vowed not to miss it again on my latest trip this past September. I squeezed in a last-minute lunch there with my friend, Queen of the Night, before my flight out. In full disclosure, Queen of the Night is acquainted with Hirigoyen. Their friendship became especially apparent to me when he arrived at our table to warmly welcome her back. Because of their relationship, I can’t deny that we were given some extra attention. Unsolicited, our plates were split, and, in a couple of cases, I suspect our individual “halves” might have been slightly augmented. And desserts – we ordered four to share – failed to make it on to our bill, a gift from the chef. But, whereas one can try to woo me with larger portions and free food,* it’s much harder to fool me when it comes to execution. The cooking was precise, confident, and bold. To see all of the photos from this meal, CLICK HERE. Or, click on the course titles for the individual photos. Hirigoyen demonstrates that precision matters just as much in home-style, comfort cooking as it does in haute cuisine. His recipes are not complicated. I’m sure any home cook could replicate the restaurant’s dishes from the pages of his latest cookbook, Pintxos. But Hirigoyen makes them with such care, and, in the California spirit, with such high-caliber products that even the simplest creations – like a salad of figs, walnuts, and haricots verts, barely blanched – prompt admiration. I can’t imagine a better version of anything we ate. The “Piquillo Pepper,” for example, was soft and silky, stuffed with warm, creamy goat cheese and topped with raisins, plump and sweet. A modest presentation, it wasn’t a modest pleasure. A rainbow of roasted toy box tomatoes, drizzled with a sweet vinegar reduction, paved the top of a puff pastry crust. Nubs of Manchego cheese – slightly melted – were tucked here and there. A confetti of basil topped it all. How did he get the tomatoes to blister just so? How did the crust manage to stay so crisp, so flaky? By far, this was my favorite dish of the day; I could have eaten a dozen more. And the Garlic Soup, which my friend insisted we order, was an explosion of garlic. It wasn’t a spicy explosion of raw garlic. Nor was it the sweet kind either – a roasted, caramelized funk that lingers for hours thereafter. This was a straightforward, garlicky punch, the kind that you sense more than you taste. The soup was fortified with a cooked egg, large strips of bacon fat, and lots of herbs. It was awesome. Hirigoyen balances salty with sweet. I like that. He cuts the salty richness of his famous Warm Sheep’s Milk Cheese and Ham Terrine with a syrupy, aged sherry vinegar. Sporting a crisp, golden edging, this terrine is the ultimate ham and cheese experience. And he appreciates textures. I like that too. Crunchy Serrano ham chips made the restaurant’s namesake dish, Piperade, much, much more than its traditional Basque origins. The comforting, sweet pepper stew – served piping hot – was enriched with a poached egg, whose yolk enrobed everything with a velvety coat. There was a little bit of everything in this bowl. This too was magnificent. Hirigoyen makes all of his pastries from scratch. Like everything else we had at piperade, they were incredibly well-crafted. 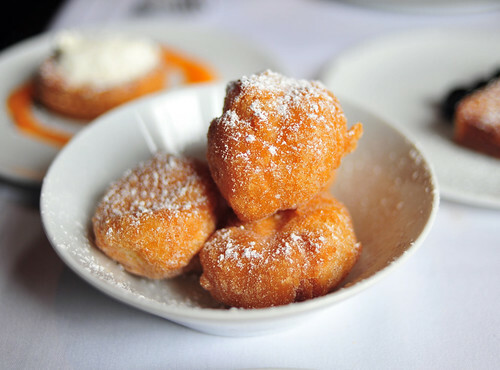 Orange Blossom Beignets were impossibly light and airy, orange blossom clouds surrounded by golden, gossamer shells dusted with powdered sugar. The fact that they arrived cool made their texture even more remarkable. But they really should have been served warm, my only complaint of the whole meal. A dome of full-fat, full-bodied kefir cheese yogurt came with slices of stewed peaches infused with vanilla and two crispy biscuits. There was, perhaps, a bit too much yogurt on the plate – it was healthful, but not slimming, and after a couple of bites, a bit cloying. Even still, the quality of the ingredients and the flavors were unimpeachable. My two favorite desserts were the Gateau Basque, a regional classic, and an Almond & Apricot Tart. These were truly outstanding. The gateau Basque was buttery and moist, layered with pastry cream and sided by meaty, preserved cherries. The tart’s crust was flaky and crisp, billowing with a toasty frangipane filling. Served warm, the little pie was ringed with an apricot puree and topped with a dollop of whipped cream. Like the toy box tomato tartlet, I could have inhaled a dozen more of these too. Located in a commercial district, piperade seems to be well-trafficked at lunchtime. Suits and skirts from nearby advertising firms and the Levi Strauss headquarters (you should drop by their lobby and see their informative display) dominated the dining room during our lunch. Judging by this meal, there’s no reason why piperade shouldn’t be just as popular at night. The service was great – our waitress was a spunky French woman with a great sense of humor and an eye for detail. The setting was wonderful, casual and festive. And, I repeat, the food was fantastic. I hope piperade remains as timeless as Hirigoyen’s cooking. * I’m in no way suggesting that Hirigoyen was trying to win favor with free food or large portions. In fact, I would have you believe, as I do, that he is simply a generous man who loves to share his food with those who love eating. ~ by ulterior epicure on November 1, 2010.
once I left a camera lens there – they managed to track me down 2 days later to let me know I had left it… not sure if this was difficult, but it sure was nice of them to take the time… Piperade is definitely underrated. Glad it’s still around. Chef Hirigoyen is a sweet man overall, on my first visit he pulled out my seat, took our order and brought out our desserts. I noticed he was doing the same for all the tables. I agree, Piperade is underrated and also agree the fried donuts were fragrant and amazing. This is one of my fave San Francisco restaurants. Gerald is such a great cook and so wonderfully down to earth. With Piperade, he’s created a restaurant that’s so warm, comfortable and satisfying.